Renaissance humanist, poet and geographer. 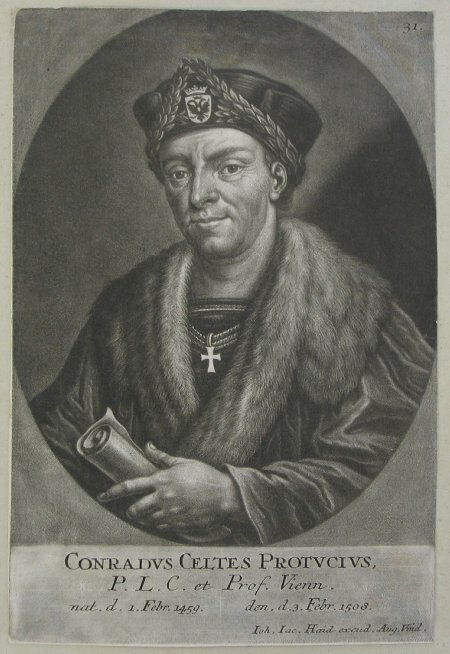 Born 01/02/1459 at Wipfeld bei Würzburg. Student of Dahlberg and Agricola in Cologne and Vienna. After widespread travels, he became Professor in Ingolstadt and later  in Vienna. In 1510 Emperor Maximilian provided him with his own faculty, where he was able to implement many of his humanist principles and extend the contemporary knowledge of geography by exploring many new avenues. In his study of the Ptolemaic worldview he made use of his own self-made World and celestial globes, an approach to study which he then attempted to introduce into schools. It was Celtes who first discovered the important 13th Century copy of a 3rd Century Roman road map in a library in Augsburg. It subsequently came into the possession of the German antiquarian collector, Konrad Peutinger, and thereby acquired its name - the Peutinger Tables. Originally in the form of a roll 22 feet long by about 1 foot wide it showed the road network of the Western Roman empire, each route depicted in a straight line, with distances indicated between the separate stages. By the late 16th Century the map was in the hands of Peutinger's relative, Mark Welser, who first reproduced it 1591 when published by Aldus Manutius in Venice. Ortelius found this copy inadequate and requested Welser to make further manuscript copies of the map, which he duly did and which formed the basis for the set of 8 engraved plates printed on four sheets which were first published separately in Antwerp by Moretus in 1598 and subsequently incorporated into Petrus Bertius' Theatrum Geographiae Veteris  and in the 1624 edition of Ortelius' Parergon. The original Peutinger Tables were lost for a period of some 100 years but were recovered in 1714 and now reside in the Vienna National Library. Celtes himself died 03/02/1508 in Vienna.